A workshop which can include a few people or a few hundred, the Nature Mandala utilizes local natural materials to build an artwork that fosters strong community and mindful connections to natural resources in the local environment. The first edition of this project was built over the course of four weeks by Patrick as an installation for the Robert Callender International Residency at Contemporary Art Space Osaka. In this first instance, each leaf was slowly picked one-by-one from the ground beneath two trees in the neighborhood surrounding the gallery space. After being collected and arranged, the leaves were again placed one-by-one into the gallery to form a large-scale mandala. 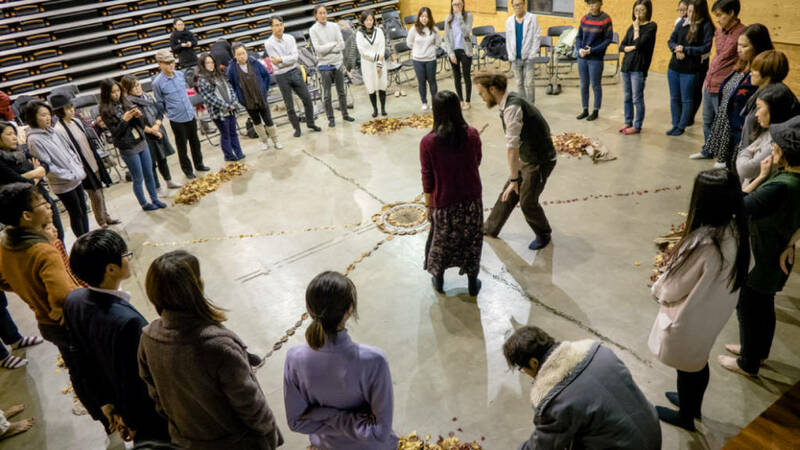 The community workshop version of the Nature Mandala is a very flexible, temporary installation that can be created over the course of a few hours or several weeks depending on the size and number of participants. The entire process is an ‘open to the public’ build, where visitors engage in the art making process with each other. After the mandala is complete, it is released back into nature by the participants. The entire process is not only one of engaging creativity and relationship with each other and the environment, but also of understanding the concept of impermanence and letting go. Participants come away with a deepened connection to nature and each other, and a heightened confidence in using their own intuition to solve problems. This project was developed by Patrick Lydon as part of the Robert Callender International Residency for Young Artists, supported in part by funding from the Sasakawa Foundation and Contemporary Art Space Osaka. The community workshop was developed with funding and assistance from Seoul Youth Hub in South Korea.